I hope the new year finds you well. Since winter has officially arrived,(what we had in November was 30" of Fall), I wanted to share some thoughts regarding snow removal from flat roofs. My first thought, based on 35 years of roof experience is not to remove snow from your roof. The only circumstances I'd recommend it is if you are certain that the roof is overloaded. Structures are constructed with 'snow load' most commonly called 'live load' built in. In other words the structure is built to support itself and around 30 lbs. per square foot of live load. Unless you have evidence that the snow is in excess of that or see/hear cracking in the structure I would leave the snow up there. The only other reason I would remove it is if you are experiencing roof leaks and it needs to be removed to stop the problem. I would suggest you contact the building architect or engineer to give you advice on the matter. 1. It's very dangerous to be on the roof. New TPO and PVC membranes are very slippery, in some ways more that black ice. If you do slip you can either fall off the roof or hit your head on roof objects. 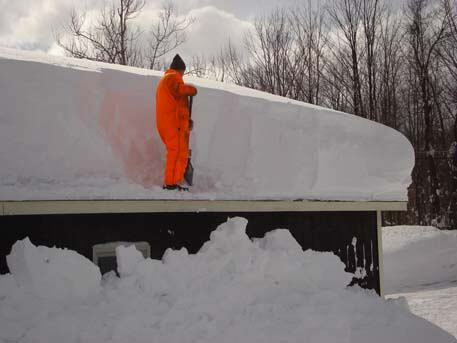 Quite a few of the roof penetrations on your roof can be hidden by snow. This past winter I shoveled off my garage roof and stepped on and ruined an attic vent. Fortunately my circumference was larger then the vent. 3. The last one is simply lawsuits. If you hire someone that is not insured and they fall and get hurt or worse yet die, count on a lawsuit. Of course insurance costs money, which makes it more expensive to hire someone with insurance. If you must remove snow then you must insist on an insured contractor. Make sure they provide an insurance certificate from their agent listing the coverages that they have for workers compensation and property damage. Snow removal can be done safely and properly but there are many things that can go wrong. If you must remove snow from a flat roof be aware of these key items and hire someone who has experience with the items mentioned and the best of luck to you. Please let us know if you have any questions or comments, we'd be glad to help!